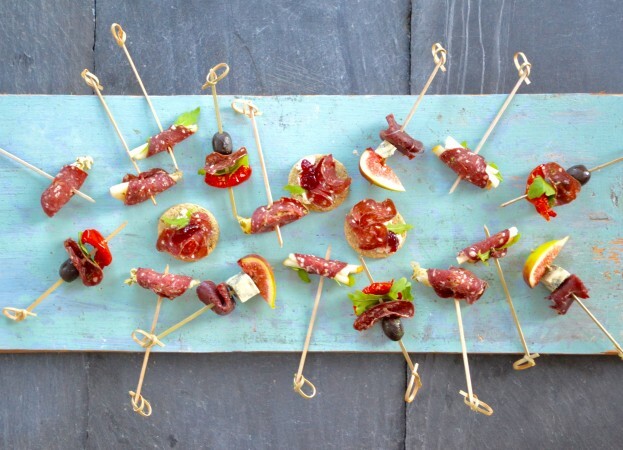 Delicious Venison Charcuterie Canapé ideas. Venison Salami, smoked venison or venison bresaola, olives, blue cheese, salad leaves, figs, sun dried tomatoes in oil, remoulade made with pear and celeriac, artichoke hearts in oil, crowdie or cream cheese, oatcakes, cranberry or redcurrant jelly. Make a remoulade with match stick sized cut celeriac and pear and a little dressing. Place a small amount in the centre of a salami slice. Hold together with a cocktail stick. Olive, quarter slice of Smoked Venison or Venison Bresaola, salad leaf and a sun dried tomato on a cocktail stick. Put a quarter slice of smoked venison or venison bresaola, a small cube of blue cheese and a quarter of a fig on a cocktail stick. Cut an artichoke in small pieces and wrap in a slice of venison salami. Secure with a cocktail stick. Spread a little crowdie or other cream cheese on an oatcake. Top with a quarter slice of salami or smoked and add a small salad leaf and a dollop of Cranberry or Redcurrant jelly. "This is the REAL thing - I’m lovin it !! Really proper artisan product, Well done guys!!"